When we are thoroughly obsessed by a certain idea and strongly wish to manifest it, we are oftentimes so blinded by the actual desire for its fulfillment that we fail to note the difficulties which we may come across, or the actions and consequences that it could bring. 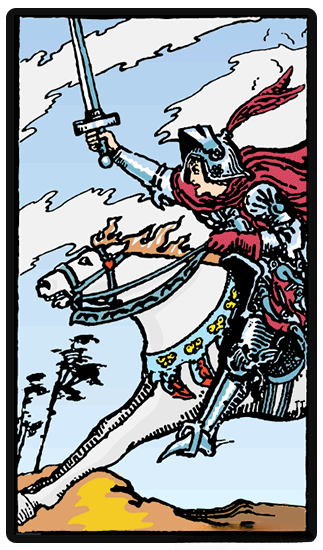 The Knight of Swords is a very powerful figure that is full of life as well as energy. This needs to be balanced with a proper and actual realization of compassion and responsibility. Once the knight sets forth towards his goals, there is absolutely no stopping him. He doesn t see - and he doesn t care - about any upcoming challenges. Once the knight sets forth towards his goals, there is absolutely no stopping him. He doesn t see - and he doesn t care - about any upcoming challenges. He is filled with sheer ambition, strength and determination to succeed with his quest no matter what. However, this determination could also blind him to see the potential consequences of his actions on others as he makes his way to success. He may charge forth into a very dangerous territory without preparation or actual foresight, and this could lead him to great danger. The reversed Knight of Swords suggests incredible impatience, impulsiveness alongside his bursting with energy. This Knight of Swords has a lot of energy but lacks any kind of direction, and this oftentimes results in them making rather rash decisions as well as pulling down other people with them. Their thoughts are oftentimes scattered throughout without any actual organization or logic. They are most likely disorganized and unprepared for the things that they actually want to achieve. The Knight of Swords reversal meaning indicates that you still have a lot of miles to walk in order to get the valuable life experience that you need in order to overcome adversities along the way. This is something to consider.